Below are pictures of work performed by our highly trained refinishing technicians. All work is performed on-site which saves the great trouble and expense involved in removing old fixtures and replacing them. 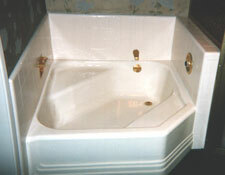 The fiberglass tub above was first repaired and then refinished. 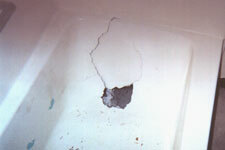 Damaged fiberglass bathtubs and showers are a common problem we deal with. Replacement is rarely necessary. 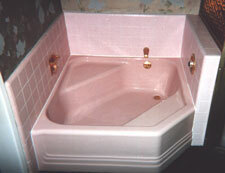 Another example of a fiberglass tub-shower unit. 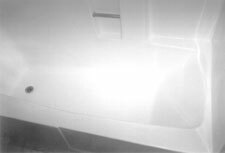 This tub had major surface blemishes. Even an impossibly horrible old bathtub can have a new life. Outdated or ugly colors can be refinished in place saving thousands over the cost of replacing.